This woodpecker likes to carve on the tree in my front yard!!!! I only see him once in a while and never have a camera other than my phone with me, of course! Samsung s8, f1.7, 4.25mm and digital zoom from about 10 feet away, 1/950 sec., +2EV, adj in Picasa and Windows. That is one very talented woodpecker! What a great idea and clever creation, Joe. Love it! Oh, my! What a talented woodpecker! . A fun creation-did the woodpecker, perhaps, get some help from you with the carving? Wonderful! Very clever, Joe. 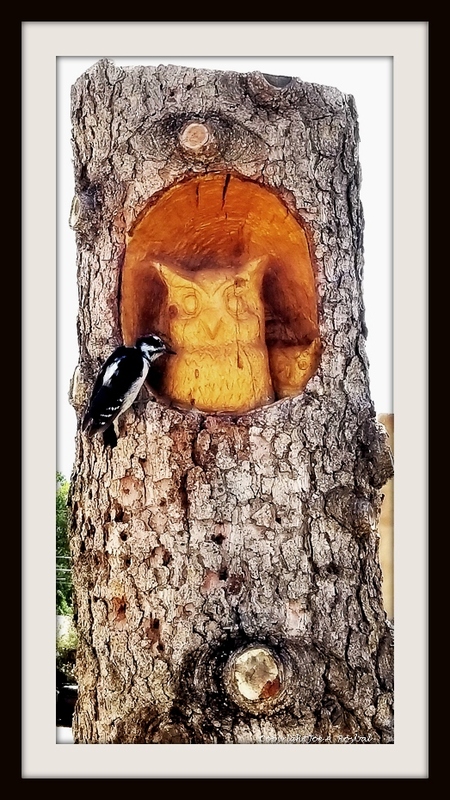 Curious why the woodpecker is carving an owl? The matt and frame are a plus. Nice work! I'm glad he hasn't decided to help me with this side yet! Curious why the woodpecker is carving an owl? Beautiful work, Joe! So many talents. I think it is an honor to get help from a bird. Very creative Joe. I like it!